Last Sunday I hopped into my second crit of the year, the Dominguez Hills CBR 1 (the first of seven events of the 2018 ?? ?California Bike Racing??? series). Because I?? ?m still a Cat 5 with aspirations of upgrading asap, I took part in the BRP (Beginner Racer Program) which consisted of a pre-race clinic, the Cat 5 race, and then a short race debriefing. The BRP effectively counts as an extra race, so I received two race ???points??? toward my upgrade. The program was a basic introduction to crit racing. The focus was keeping your hands on the bars, following the wheel in front of you, taking the correct line through a corner, and how to correctly put your bib number on your jersey (seems trivial, but almost everyone does it incorrectly the first time). I personally didn?? ?t get all that much out of the program, but I think it is a good concept and I can imagine it being helpful to people that are brand new to bike racing. Cycling can be an intimidating sport to get into for a variety of reasons, and it?? ?s nice to see a governing body like USA Cycling with programs that are focused on getting more people involved safely. I wasn?? ?t thrilled with the 6:15 am start time (especially on a cold morning! ), but I think it was worth my while for the extra upgrade point. Trying to break away from the field. This field was pretty big ??? nearly 70 riders. In hindsight, that should have been my first clue that I may want to tweak my tactics a bit. My game plan, however, was essentially the same as the previous week in Ontario: stick to the front, take the occasional hard pull to keep things fresh, and try to get away in the final five laps or so. I stuck to my game plan, but this time it was only good enough for 2nd place. When I made my move to get off the front just before three laps to go, someone immediately marked me and sat on my wheel. The field was able to keep me well within sight this time, so I was concerned that if I let up at all, including pulling off the front to share the lead, the group would quickly pull us back in. While my fitness is pretty good from my years of triathlon, this was just another lesson in the intricacies of bike racing, and one I won?? ?t soon forget. In the time since the race, I?? ?ve gone over what other moves I could have made, and where I went wrong. It?? ?s fun to be this excited about analyzing a sport again. Results. Still happy to represent Team Simple Green on the podium! The week after the race I put in a request for an upgrade to cat 4 early (I now have 7 ???points??? out of 10 required). I was given differing experiences from other athletes that were either allowed to upgrade early or denied. The worst that could happen is that my request would be denied and I would have to complete all 10 races. So I gave it a try??? DENIED! ?? ?The 10 race (or clinic) requirement is firm.??? So this upcoming weekend I will be driving all over Los Angeles to finally get my last three points in. On Saturday I will be doing a ???mentored??? crit race (which counts as two races) way out in Redlands and on Sunday I will be racing at CBR #2 in Carson for my final race. This will allow me to be able to race Cat 4 for some of the upcoming road races that I think I can do really well at, like Cantua Creek, Pine Flat and the UCLA Road Race in Pearblossom. 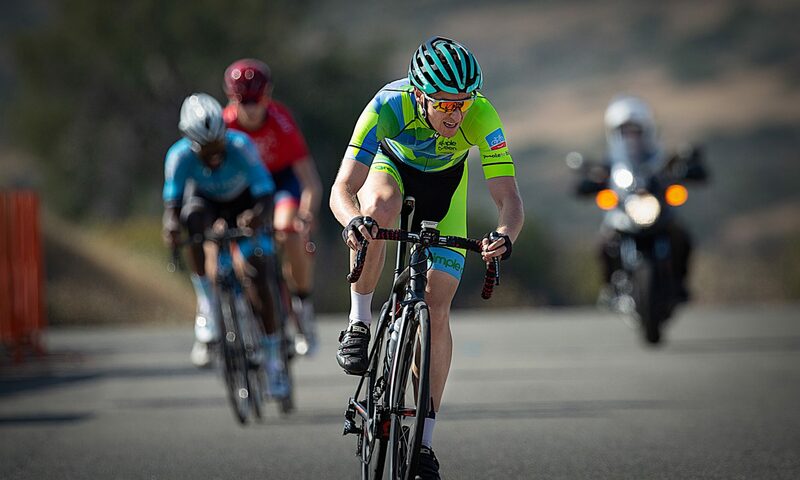 Thank you to Paul Cressey Photography for these shots at the CBR Crit #1 in Dominguez Hills. Here is his full photo album from the event. Paul tells me he will be out at the next CBR Crit in Carson on this Sunday.